Dreamers’ Circus, a new driving force in Nordic music, will perform on Saturday, April 13 at 7:30 p.m. at the Weis Center for the Performing Arts. Contemporary and endlessly innovative in their approach, the group draws inspiration from regional folk music traditions and reshapes them into something bright, shiny and new. 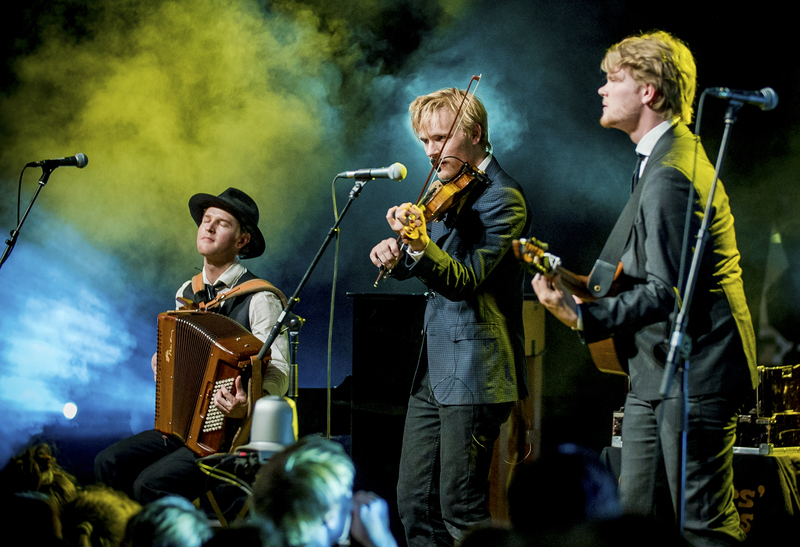 Dreamersʼ Circus is comprised of Nikolaj Busk on piano and accordion, Ale Carr on Nordic cittern and Rune Tonsgaard Sørensen on violin. The trio views its traditional roots as a point of departure for its music. This adventurous attitude, coupled with outstanding musicianship, has brought the band to the forefront of the Nordic folk and world music scene. The members of the trio have various musical backgrounds but what unites them is an interest in and love for folk and traditional music. Rune grew up in a household where traditional dance and music was enjoyed but he also studied classical music and to this day plays as a member of world-class chamber music ensemble, The Danish String Quartet. Nikolaj Busk’s background in jazz is evident in his fluid and melodic playing while Ale Carr is from a family of well-known traditional musicians and teachers in his native southern Sweden and his rhythmic drive forms the backbone of the band. The music of Dreamers’ Circus defies instant classification. It’s a music that transcends genres and seeks to unlock imaginations and create small and big stories that form images in our mind. Think of the vivid colors we associate from childhood memories of the Circus. Remember the magic on entering the tent as a child. The sensory overload… the magic we felt. This is music that allows us all to dream and takes us to wondrous places each time we listen. Whether playing with symphony orchestras or rocking the Roskilde Festival or joining The Chieftains onstage in Japan, Dreamers’ Circus have enjoyed numerous career highlights as they celebrate ten years together as a band. Over those ten years they’ve undertaken some memorable theatre work collaborating with the Danish String Quartet to arrange and perform the music of famed Danish twentieth century composer, Carl Nielsen in an acclaimed production.